When Star Trek: Voyager premièred in January of 1995, the Star Trek franchise was at the height of its expansion. The Next Generation’s final season was nominated for Outstanding Drama Series at the 1994 Emmys, the only syndicated series to achieve such a distinction, and that series’ cast was preparing to transition into movies. Deep Space Nine had been launched two years earlier to critical applause. But Voyager was not only a new Star Trek series. It was to be the flagship for UPN, Paramount’s venture into the broadcast-network game. Luckily, the two-hour pilot, “Caretaker,” pulled in an impressive 21.3 million viewers. At the time of Voyager’s planning, each of the three executive producers was also overseeing some other arm of the Star Trek property. Rick Berman was focused on the film Star Trek: Generations, micromanaging every frame of footage as he had done with every other Trek he’d been involved with. Jeri Taylor ran the final season of Star Trek: The Next Generation, subtly transforming the science-fiction morality play into a freewheeling family reunion. The season marks the debut of Geordi’s mom, Data’s mom, Picard’s son, Worf’s foster brother, Dr. Crusher’s grandmother, and the list goes on. And Michael Piller had similar duties on Star Trek: Deep Space Nine, which had the sole spotlight in the Star Trek universe for a total of three months at the start of its third season, just as its long-term story was heating up. The starship Voyager, on the other hand, finds itself at a big satellite controlled by another seemingly omnipotent entity, The Caretaker, who presents as an old human man putting on a kind of hoedown for the crew he’s kidnapped. It turns out that his technologically advanced society had obliterated the environment of a planet called Ocampa, whose natives have life spans of about nine years, so two of The Caretaker’s species stayed behind to provide for them. Now, The Caretaker is dying, his companion has long ago moved on, and the Ocampa run the risk of being dominated by the tribal Kazon, unless the Voyager crew can help him. Captain Janeway makes the decision to destroy the Caretaker array that brought Voyager to the Delta Quadrant instead of further disrupting the balance of power in the area. Without the array and at maximum warp, it will now take Voyager 75 years to get back home. “Caretaker” invokes ’90s environmentalism, a superpower’s role as world police, and two oppositional parties working together to run that superpower as best as they can, but it’s nothing so much as a reminder of Gene Roddenberry’s Prime Directive. Starfleet is expressly prohibited from interfering with the progress of pre-warp societies. The Caretaker’s species had no such guidelines and nearly wiped out a whole species. Now, Voyager has the task of upholding Alpha Quadrant standards in the absence of Alpha Quadrant hierarchy. Weirder still, “Caretaker” is told largely from the perspective of Starfleet wash-out Tom Paris, who starts off working at a penal colony on Earth and winds up risking his life to save Maquis Commander Chakotay, with whom he has bad blood. While fairly paint-by-numbers, this redemption story isn’t unexpected. Voyager’s crew is a diverse spread of untested sailors: In addition to Paris and Chakotay, there’s the fresh-faced recent Academy graduate Ensign Harry Kim; the Latin human-Klingon hybrid B’Elanna Torres; ostensibly the first Ocampa to leave her home planet, Kes; the rogue Delta Quadrant loner Neelix; and an unnamed holographic doctor designed for use in the case of emergency. The most experienced officers are black Vulcan security officer Tuvok and Captain Janeway herself. In fact, it’s the white male crewmembers, the first officer and the human doctor, who get killed in the Caretaker’s intervention. Which makes it all the stranger that the first female captain of a Star Trek series is introduced through the eyes of a straight white male. Mixed signals abound on Voyager, but nowhere so much as the show’s approach to feminism. With its cast of prominent female scientists who possess rich interests and social lives, the show routinely makes the Bechdel test a thing of the 21st century. But then there’s the way Janeway isn’t even the star of her show’s pilot. Janeway’s an authoritative figure, unquestionably the most stubborn of all the stubborn Star Trek captains, but her decision-making tends to seem reckless. When Voyager discovers super-powerful, super-dangerous Omega particles, Starfleet requires captains to throw out the Prime Directive and destroy them. One minute, Janeway goes on lockdown, preparing to leave her crew to accomplish this confidential task. The next, she’s spilling the beans to the ensign on her senior staff. Then there’s kidnapped ex-Borg Seven of Nine (a late addition to the cast, played by Jeri Ryan), whose dehumanized delivery is packaged in a catsuit Emma Peel would blush at and a Borg implant that doesn’t dare disfigure her face. The one cop to Maquis discontent is a woman named Seska, who spends most of the second season secretly working with the Kazon. Then, in a classic twist of Star Trek’s famous species essentialism—the idea that its alien races were all driven by certain unchanging psychological quirks—she turns out to be a Cardassian spy embedded in the Maquis. Eventually, Seska claims to have stolen Chakotay’s DNA and impregnated herself with his child, one last soap-opera twist for the fiercely independent, baby-crazy traitor. Speaking of species essentialism, while Seska’s Cardassian heritage makes her out-and-out evil, Deep Space Nine’s Cardassian spy, Garak, follows in the footsteps of The Next Generation’s Klingon Worf in upending traditional species roles. Voyager’s sister show even makes room for subversive Starfleet officers and heroic Ferengi, traditionally a selfish bunch driven by greed. Voyager doesn’t have nearly as much faith in Roddenberry’s drive for “infinite diversity in infinite combinations.” The closest it comes is Talaxian Neelix, and his journey from selfish to selfless rests comfortably inside Quark’s more extreme arc back on Deep Space Nine. Even Seven of Nine, who transcends her long history and literal hard-wiring as a member of the fearless, culture-assimilating Borg, discovers compassion as a trait inherent to her humanity. She’s not rebelling against Borg values. She’s recovering her human ones. The main reason Voyager fails to make as strong an impression as its counterparts is its bland characters and repetitive stories. Like a Lost knockoff that retains the flashbacks but loses the intrigue, Voyager keeps telling the same stories about the same people, most of whom are defined by a single characteristic. Generic Native American Chakotay has some spiritual quest or another, often literalized through aliens. Torres resists and then gives into her Klingon heritage, undergoing the latest Alpha Quadrant ritual. Kim gets kidnapped by aliens. Neelix proves himself as a Starfleet officer. Tom Paris lusts after a woman. Voyager finds a way to get home slightly more quickly but ultimately can’t take advantage of it because Gilligan knocked over the radio or something. Several Wikipedia episode synopses read like parodies (see: “Harry Kim is contacted by a planet full of women”). No wonder the science-fiction stories are the most potent. In season one’s “Eye Of The Needle,” Voyager finds a wormhole back to Romulan space with a final twist so good Deep Space Nine would later incorporate it. The next season has fun with quantum theory when Voyager splits into two. In season three’s “Distant Origin,” an alien stands trial on his home world for positing that his species evolved from aliens across the galaxy. He looks like a humanoid dinosaur, and it takes two commercial breaks to get to a regular character. Voyager was conceived as an action-adventure Star Trek, closer to the original series than the diplomacy-heavy sequels, and it gets close in these science-fiction morality plays. Janeway arbitrates an assisted-suicide debate among the Q, a war memorial causes the crew to experience devastating flashbacks to a war they never fought, and a two-parter traps the crew in a year of deadly attrition all because a 29th-century time-traveler is trying to temporally resurrect his murdered wife. Voyager also boasts surprising self-awareness. The Prime Directive of non-intervention is the goal from inside the ship, but Delta Quadrant aliens tell Janeway they see the Voyager as a ship of death. Destruction invariably follows in its wake. Another off-format episode, “Living Witness,” sees Voyager in a museum far into the future as a native society educates its populace about the long-since corrupted history of the Machiavellian crew. Nevertheless, aliens are constantly lusting after Voyager’s technology. The Kazon steal a transporter, traders steal the ship’s weapons, and still other aliens seek its warp plasma. What’s more, advanced Starfleet technology is repeatedly offered for trade in spite of the holy law. The Kazon are obsessed with the replicator, which has created an economy of almost limited scarcity and enlightened modesty on Earth. Some crewmembers conspire to trade a replicator for a powerful transporter that could hasten the journey home. A species of hunters called the Hirogen find new life in Voyager’s holographic technology. Deep Space Nine is fearlessly upfront about the dark side of superpower-dom, but Voyager is also constantly considering the costs and concerns of power. Holographic technology, in particular, is the focus of Voyager’s science fiction, starting with the holographic Doctor. Designed as a follow-up to The Next Generation’s sentient hologram villain, Moriarty, the Doctor is unusually self-aware. He’s an emergency program with poor bedside manner and the dry wit of Robert Picardo. He’s summoned by the crew when they need him and left on when they leave, unable to turn himself off and stuck alone in Sickbay until someone else comes along. Then medical assistant Kes starts to help him soften. She invites him to search for a name and encourages him to pursue interests. At first he’s confined to Sickbay, but then he gradually increases his mobility to the Holodeck, where he even creates a family, and to key areas of the ship. Later, a 29th-century mobile emitter allows him to go wherever the emitter will function, a timeline violation that Janeway allows. Over the course of the series, the Doctor goes from sighing software trapped in a Sartrean hell to a heroic Renaissance man. And he’s not alone. Voyager encounters a murderous hologram with a prejudice against “organics,” The Doctor’s 2.0 replacement, and a whole society of holograms consigned to a life playing The Most Dangerous Game with the Hirogen hunters. The recreational Holodeck programs are mostly duds, ranging from an English governess mystery to a spitball session with John Rhys-Davies’ Leonardo Da Vinci, but it’s easy to see why Star Trek’s famous Holodeck larks seem to take over Voyager. Janeway may have to deal with depleting deuterium, but she keeps the Holodeck perpetually running because those are people in there. She even falls in love with a holographic Irish bodice-ripper stereotype. Voyager is fascinated with, concerned by, and curious about virtual reality in the early days of the Internet. Not that the writing sells it, but in the wide view, Voyager’s preoccupation with holograms is an essential part of the Spock-Data-Odo look at what it means to be sentient, what it means to be human. In “Bride Of Chaotica!,” a Flash Gordon-style black-and-white ’30s space serial, Voyager even pulls off a successful trapped-in-the-Holodeck episode, a usually eye-rolling Star Trek staple. Halfway through the series, the Doctor takes on the Kes role toward Seven of Nine, helping her to recover her humanity. He holds lessons on social customs and even starts to fall for his protégé. Like Picardo, Jeri Ryan has a way with dry, arrogant delivery, but with the bonus of Seven’s absolute awkwardness. From that point on, Voyager essentially ditches the ensemble focus that defines the Star Trek sequels in favor of a classic trio, Janeway, the Doctor, and Seven. There’s no Kirk-Spock-McCoy tension, exactly. Janeway doesn’t balance the other two. But these core relationships are so compelling that defanged Maquis and eager-beaver ensigns can’t compete. Ideal 24th-century Starfleet personnel may be emotionally incapable of extended conflict, but ex-Borg have no such discipline. Seven is intensely antagonistic toward Janeway, and she repeatedly defies her orders in pursuit of self-interest. But as the series heads into the home stretch, Seven and Janeway find mutual respect. The Doctor helps Seven pursue interests. And she even becomes a surrogate mother to ex-Borg children who join the crew. 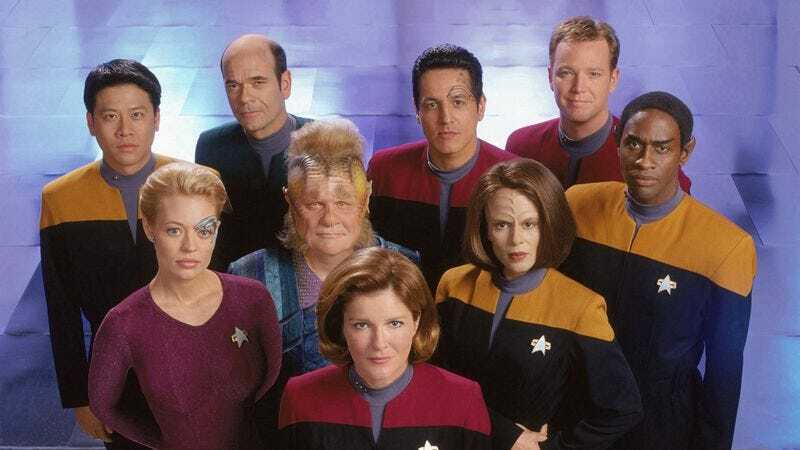 Voyager was designed as a ship of misfits and mercenaries grudgingly learning to work together, but it never really feels that way until the last half of its run. Still, Voyager’s ratings declined in tandem with its four-year project to defang the Borg, and its final two seasons underperformed Deep Space Nine at its lowest. After the new Star Trek standard of seven seasons, Voyager ended with a whimper. When the series began, Star Trek was bigger than ever, and Voyager explicitly tried to get back to basics instead of pushing ahead. In its wake came the George W. Bush era’s Enterprise—set before the original series and captained by a Southern, straight white male—and now J.J. Abrams’ original-series movies—action-adventure romps without much in the way of an explorer’s curiosity or science fiction’s moral dilemmas. Voyager may have presided over the property’s decline, such as it was, but looking back, Voyager eventually found what it was looking for: not just plot resolution, but also a character study about strong personalities longing for a place they can call home.